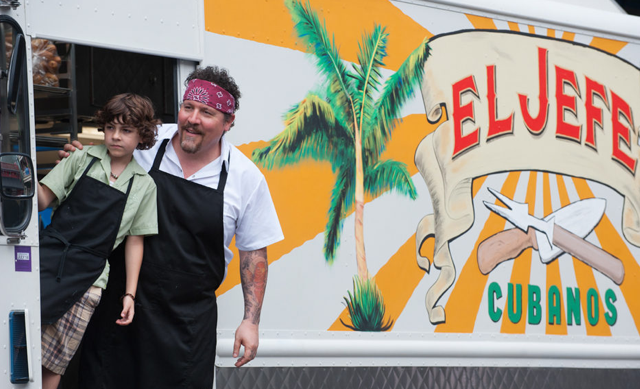 First of all, see the movie “Chef.” It’s my favorite movie this year and it may easily be yours. Then I challenge you to ignore your overwhelming craving for the roast pork they make for their cubano sandwiches. I certainly couldn’t, and had to get to the bottom of that delicious-looking roast. Apparently Roy Choi created the original recipe for the movie, but I delved a little deeper into other options, getting some direction from a website evocatively titled Three Guys from Miami. Sorry, Chef Choi! Adorable father-son bonding movie with food as its love center — what could be better? Roasted pork is so succulent and flavorful that I have been moved to declare this my year of pork. Many cuisines around the world make such good use of pork, and just focusing on roasted options would achieve my goal. There are carnitas and cochinita pibil, and in our own country, pulled pork, prepared in a variety of styles. Yes, a year of roasted pork will go down nicely. The mojo is the whole deal — it’s both a marinade and a sauce, packed with a delicious sour, herbal, garlicky punch. You’ll just want to spoon it on everything, and when you make the Cuban black beans and rice to go along with the pork, you’ll spoon it on those, too. The day before, prepare the mojo (the pork will marinate in the mojo overnight). Stab the pork all over, making deep slits in 8 to 10 places. 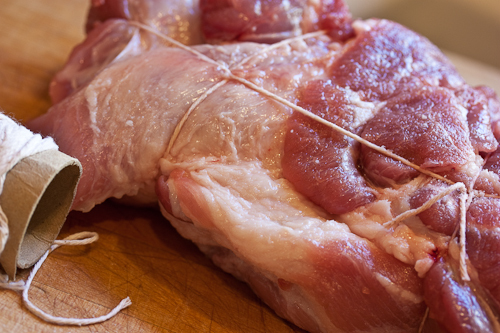 Rub the 2 tablespoons of salt all over the pork, and tie with string to contain loose sections if needed. 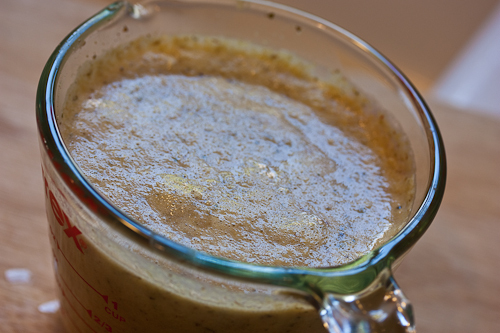 Put all of the mojo ingredients in a blender or food processor and liquefy. Reserve 3/4 cup of mojo and put it in the refrigerator. Pour the remaining mojo over the pork, working it into the slits. 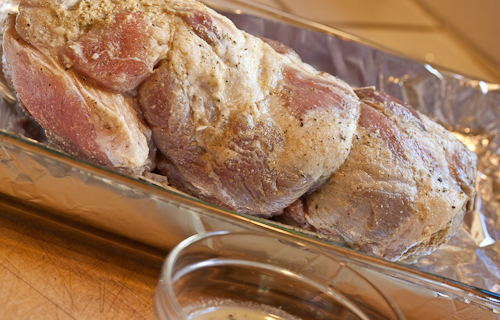 Marinate the pork in the refrigerator overnight in either a tightly covered glass bowl or a zip lock bag. 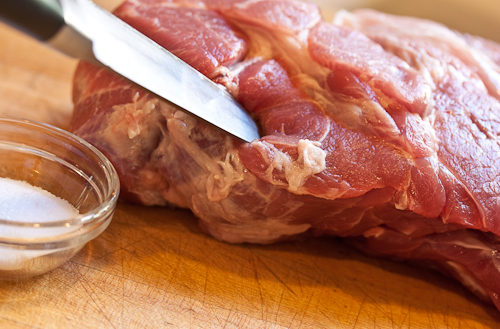 The next day, remove the pork from the refrigerator about an hour before cooking and let it come to room temperature, leaving it in its marinade. Preheat the oven to 450°F. Place the pork in a roasting pan, fat side up. Pour the leftover mojo marinade into a small bowl. Use this marinade to baste the pork as it cooks, making sure to discard any that is left over at the end of cooking (it has been in contact with raw meat and is not consider safe to eat without cooking). Cook the pork for 20 minutes at 450°F and reduce the heat to 325°F for the remaining cooking time, about 3 hours depending on the size of the roast. 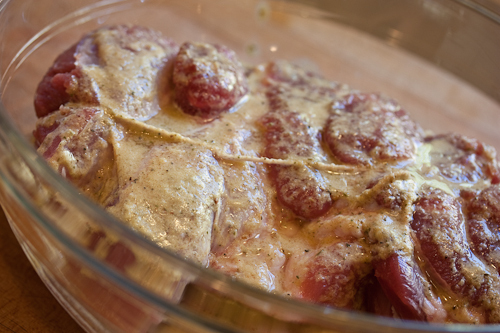 Drizzle a spoonful or two of the leftover marinade over the pork a few times as it cooks. 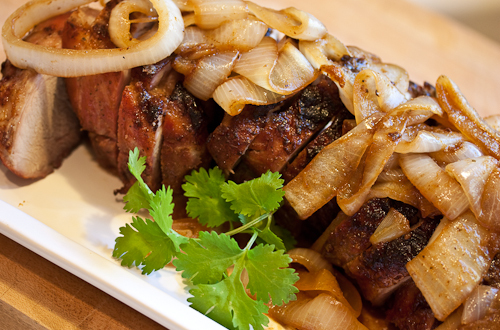 The internal temperature of the roast should be above 170°F, and the juices will run clear. Remove the pork from the oven and place on a platter. Cover it with a foil tent and allow it to rest for 15 minutes or so. Meanwhile, scrape the pan drippings and some of the crusted bits into a large skillet. 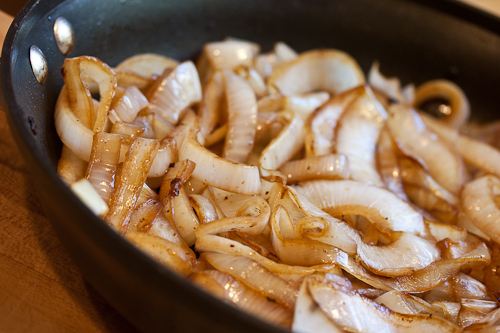 Heat the drippings over medium high heat and cook the onion rounds until they are browning and caramelizing, about 15 minutes. Using the reserved mojo from the refrigerator, add 1/4 cup to the onions and cook until heated through, about 5 minutes. They start out a bit oversized for the pan but they will cook down! 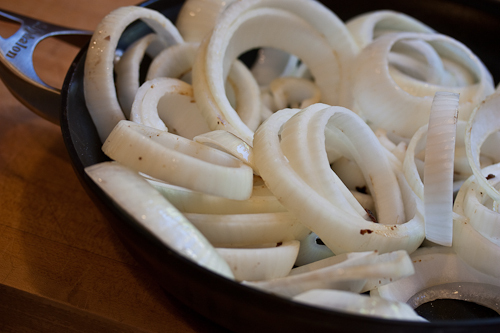 Slice the pork across the grain into thick pieces, and serve with the onions on top. The reserved mojo can be passed at the table. And tomorrow you will make a cubano, and maybe even tweet about it! 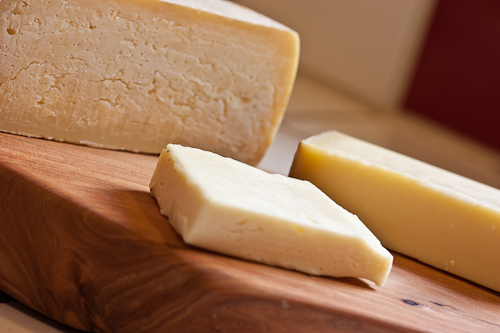 The dish is traditional Northumbrian, and while it adapts beautifully to any cheese, the North Country cheese, Wensleydale, is that region’s cheese of choice. Sound familiar? It’s Wallace’s obsession (and Gromit’s perpetual trial). 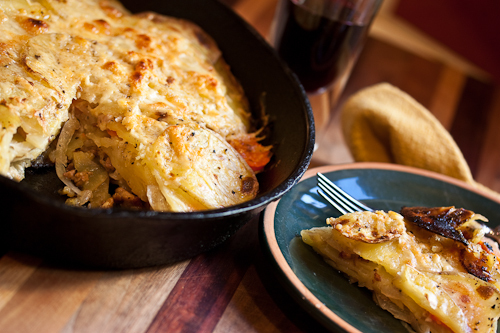 This dish celebrates cheese and its natural companion, the potato. For this one I’ve chosen three different cheeses, two of which I made here at home. I’m working on developing a cheese plant (that IS my far-off, and I hope not-too-distant, vision) and these are two of my trials. I’ll soon be posting about my progress at Little Sister Creamery! This recipe is really an open book — make it entirely veg, or use leftover chicken, fry a few strips of bacon and crumble them in instead of the sausage, try chopped ham or prosciutto, whatever is on hand. 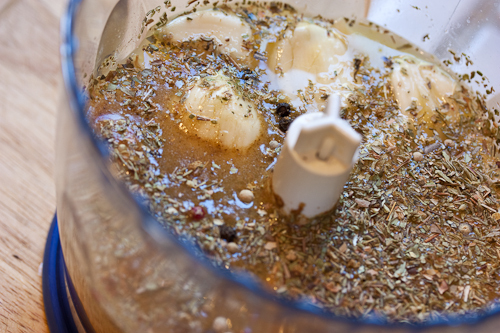 You can also use a little garlic if you like, or herbs, but I’ve kept mine very, very simple. 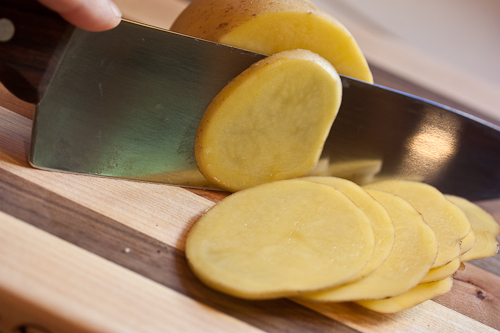 Thinly slice the potatoes without peeling. Heat the olive oil in an ovenproof pan (I like an 8-inch cast-iron pan for this) over medium heat. Peel away the sausage casing and brown the sausage meat, breaking it up into bits. 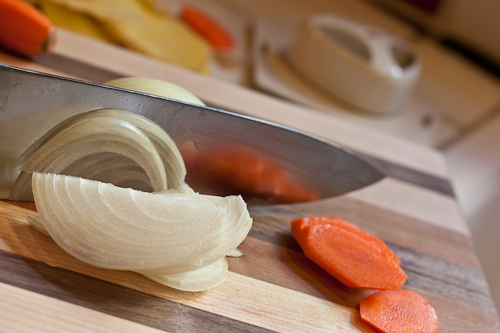 Remove with a slotted spoon and reduce the heat to medium-low. 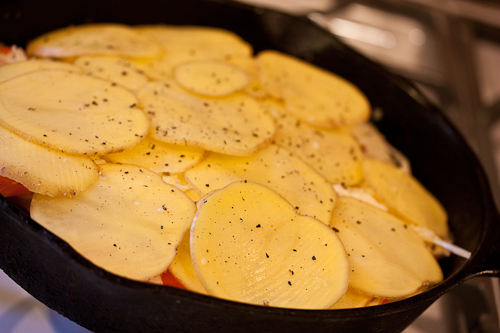 Layer 1/3 of the potatoes on the bottom of the pan, pressing them down to make sure there is contact. Scatter 1/2 of the onions, 1/2 of the carrots and 1/2 of the browned sausage over the potatoes. Season salt and pepper and scatter 1/3 of the cheese over the top. Repeat a layer with another 1/3 potato slices, the remaining onions, carrots and sausage, season, and another 1/3 cheese. End with the rest of the potato and season, reserving the last 1/3 cheese for the final step. Cover and continue cooking over medium-low heat for 40 minutes, or until the layers are very tender when pierced with a skewer. Uncover the dish for the last 5 minutes. Preheat a broiler. Scatter the final 1/3 cheese over the top and slide the pan under the broiler. Cook until the top is bubbly and brown. 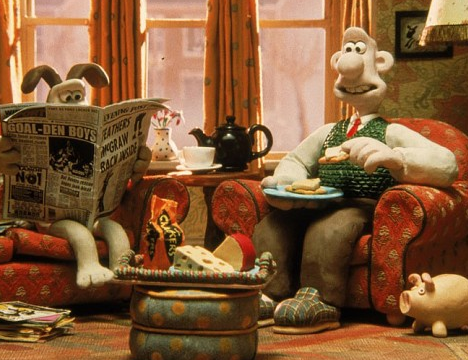 I do recommend the little salad and glass of wine, and an amusing companion — think Wallace and Gromit!